Djoser | Could Joseph and Imhotep have been the same person? The only lasting evidence of Joseph in Egypt that one might expect to have survived the last 4000 years are the grain silos that were cut into the ground in key Egyptian cities. Grain silos date back to the Third dynasty and were utilized extensively in the Djoser Complex designed by Imhotep. In fact, the Step Pyramid seems to have been built on top of a shaft that could originally have been used to store grain. The complex seems to be a grain storage and distribution center. When Djoser (Netjerikhet) died, he was entombed in this protypical grain silo and a series of Mastabas were build on top resulting in the Step Pyramid. The Famine Stele not only confirms that Djoser and Netjerikhet were the same person, it confirms that Djoser was a hereditary Land Lord and left the land to the Priests. The Famine Stele tells the story of how Imhotep came to Djoser in his 18th year and interpreted his dream. It records how Imhotep saved Egypt from a seven year famine. These archaeological findings and historical records are strong evidence that Joseph and Imhotep were the same person. The problem remains how to account for the discrepancy in chronological timeline if the Israelites were in Egypt 430 years and the Exodus took place in the 13th dynasty. Given Joseph’s position and achievements, one would expect to find some evidence for his existence in Non-Biblical Egyptian records and archaeological discoveries. (See Evidence for the Israelite Sojourn in Egypt). The identity Joseph in Egyptian history is debated, but some scholars identify him with Imhotep, who was the vizier during the Third Dynasty under Pharaoh Netjerikhet (also calledDjoser / Zoser). Imhotep is perhaps the most highly acclaimed vizier in Egyptian history, having designed the first pyramid; the Djoser Pyramid (also called the Step Pyramid). 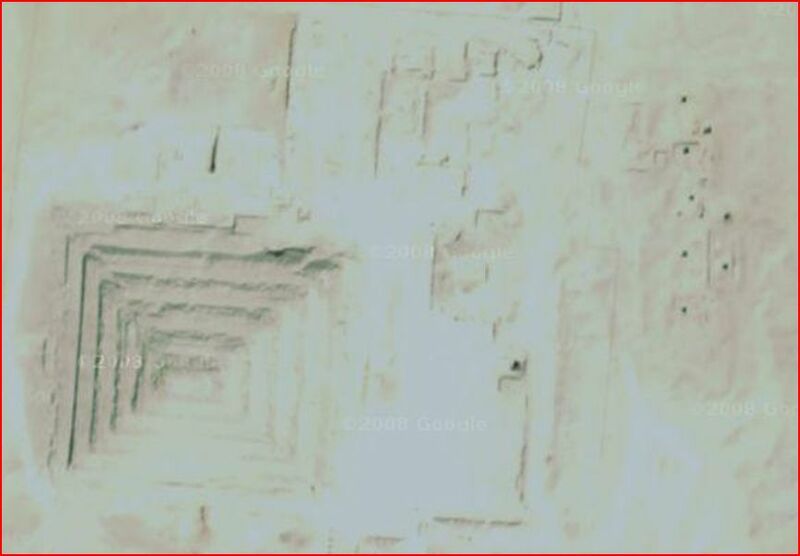 This Pyramid has a large vertical shaft under it and the complex contains many similar structures that seem to have been used to store grain, hence the connection to Joseph. 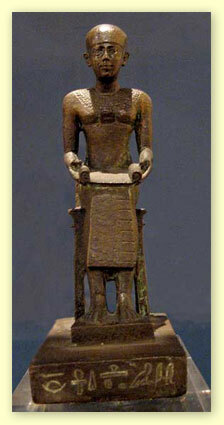 Imhotep is also credited with having saved Egypt from a seven year famine (see Famine Stele). Imhotep is reputed with having designed the first buildings with columns, written many literary works, and developed preservation techniques. Hundreds of years after his death, his legend had grown so much so that he was worshiped as a deity, particularly during the Ptolemaic period. Pilgrims would bring mumified animals to his tomb in the hope of being healed. Is it really surprising that Egypt’s most accomplished vizier would be none other than the Joseph of the Bible? If Joseph had saved all of Egypt and brought up all the land in Egypt, one would expect him to be a very prominent vizier, if not the most prominent. Imhotep built grain silos and saved Egypt from a seven year famine and his pharaoh, Netjerikhet (Djoser) was considered a hereditary Land Lord (see Famine Stele). Heiroglyphs of Egyptians retrieving grain using an open stairwell. This was a great improvement on the tunnels of the first grain silo that were poorly ventilated and resulted in workers suffocating. A statue of Imhotep in the Louvre. Joseph of the Bible and Imhotep were most likely the same person. A schematic diagram illustrating the relationship between the Egyptian Kingdoms and dynasties and the various phases of Israel as the Israelites grew to be a nation while they were in Egypt and then traveled to the promised land where they were ruled initially by Judges and later by Kings. The nation of Israel became divided into North (Israel) and South (Judah) after Solomon. There was no first intermediate period. The first grain silo Joseph – Imhotep built; hidden under the Step Pyramid!